Shaky candidate. When a Windows tablet provides sufficient performance, ports, input devices and storage capacity, why would you need a conventional notebook or even a desktop PC? 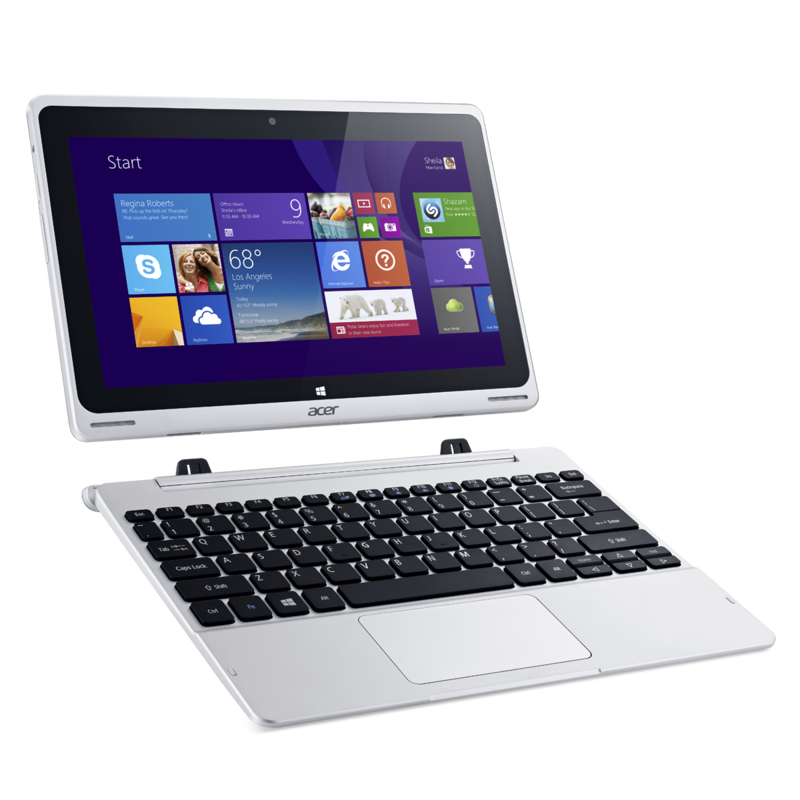 Acer brings the advantages of a laptop to a tablet via keyboard dock including hard drive. 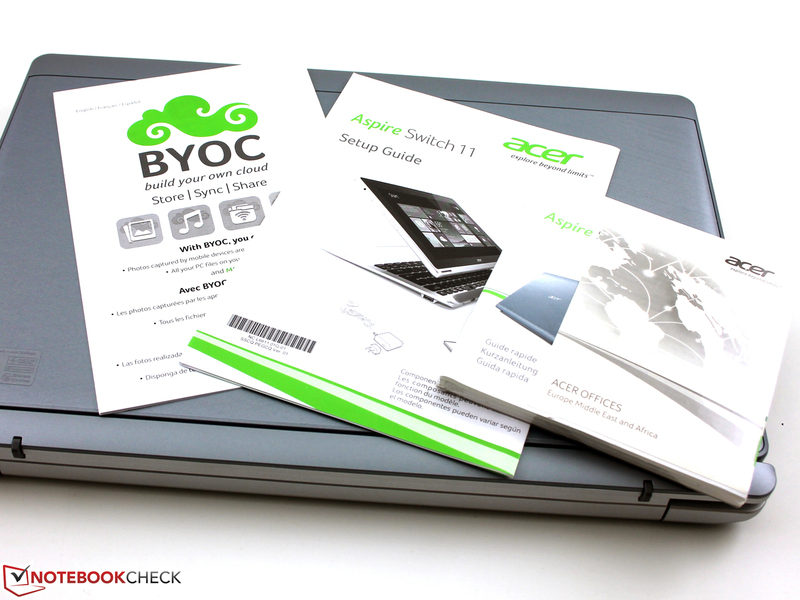 Acer Aspire Switch 11 Pro + HDD keyboard dock: Business with Acer? Windows on a tablet is already pretty familiar, but after many reviews of Windows tablets with 7, 8 or 10-inches (Captiva Pad 10.1), it is finally interesting again: The 11.6-inch Switch 11 Pro from Acer has a Full HD panel (IPS), a 128 GB SSD, a Core i5, a keyboard and a hard drive. This means the device could be the dream for many users: Mobile and light if necessary and powerful enough when you have to make your taxes. 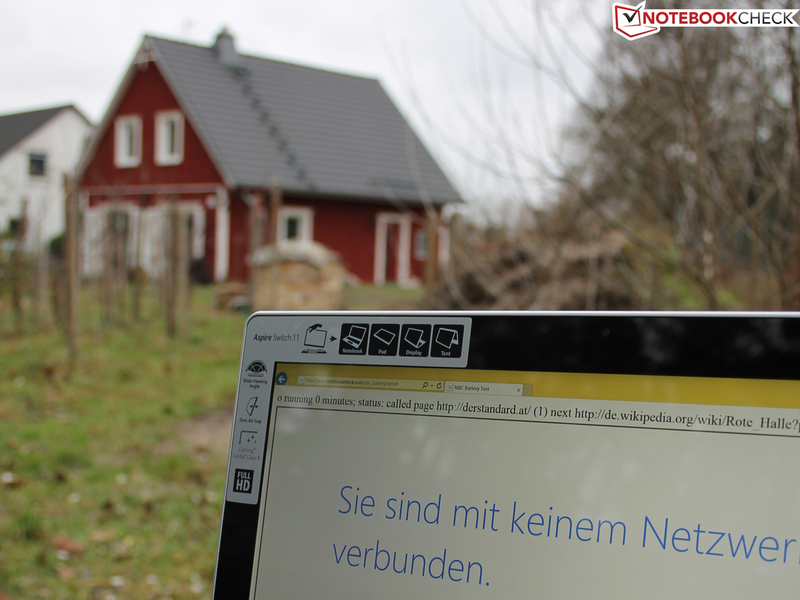 With such a device, the average Windows user does not need another PC, do they? 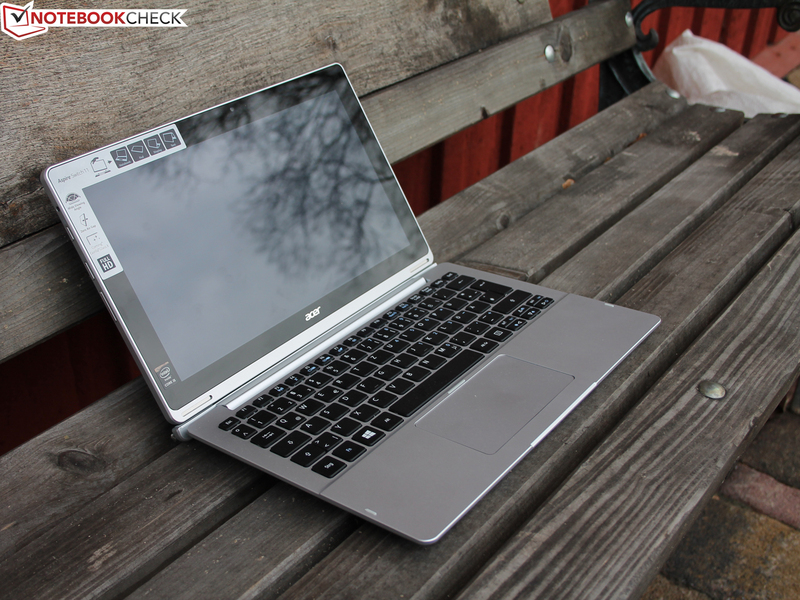 We already reviewed a couple of devices over the last months that could keep up with notebooks in terms of performance. The temperature development was often an issue, just like the short battery runtimes in some cases. 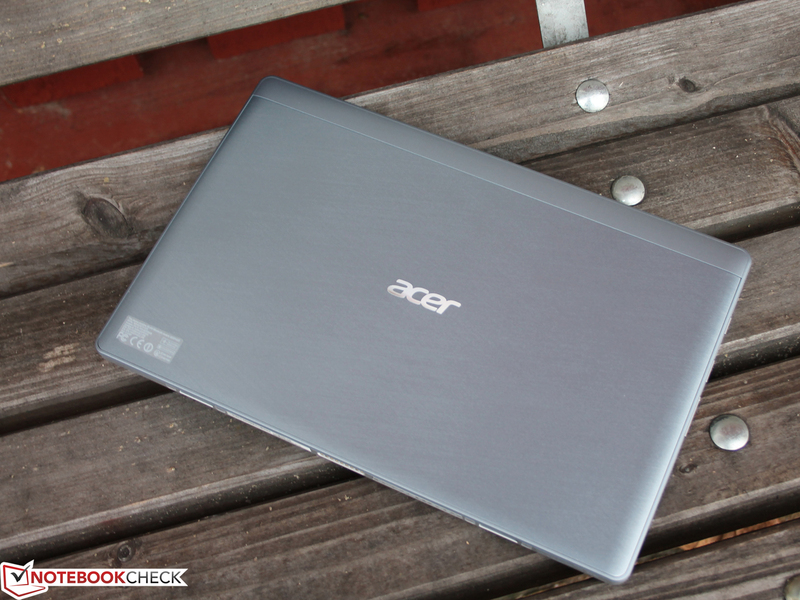 Acer actually managed to design a fanless system without the frugal Broadwell Core M chips. Fanless, long battery runtimes and a good performance – can the Switch 11 Pro combine all these aspects? 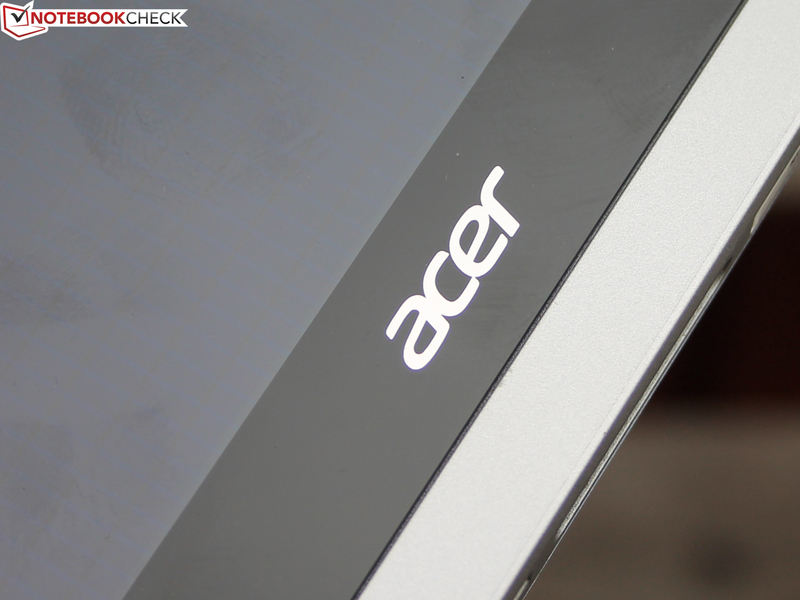 Acer still uses the Haswell mobile CPUs for the Switch 11 Pro. It is supposed to meet all the requirements of a small mobile Windows PC, but it is still a handy 11.6-inch tablet with a weight of 843 and 1,643 grams, respectively (tablet and tablet with the dock). The competition in the price range up to 1,000 Euros (~$1137) did not sleep; we think the following devices are the most interesting rivals for the Switch 11. The first two models, the Yoga 2 11 and Transformer Book Trio, are probably the biggest competitors. 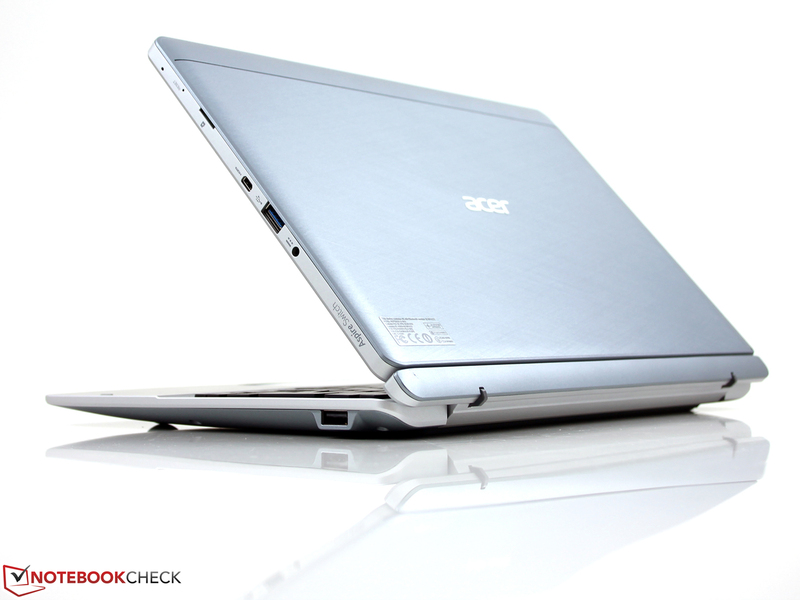 They are significantly cheaper and also have a hard drive; the Trio is even equipped with a Core i5. All the other devices are shipped without a hard drive. 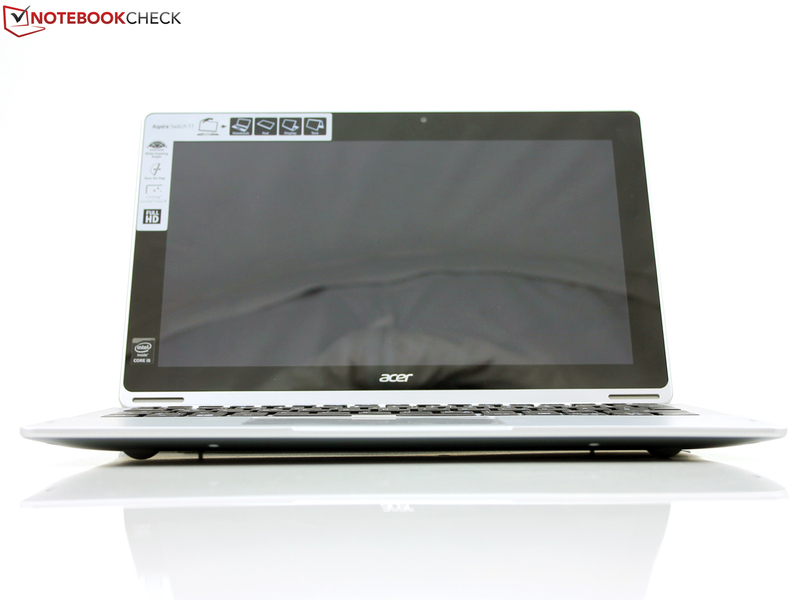 Acer uses a chassis that is completely made of plastic. 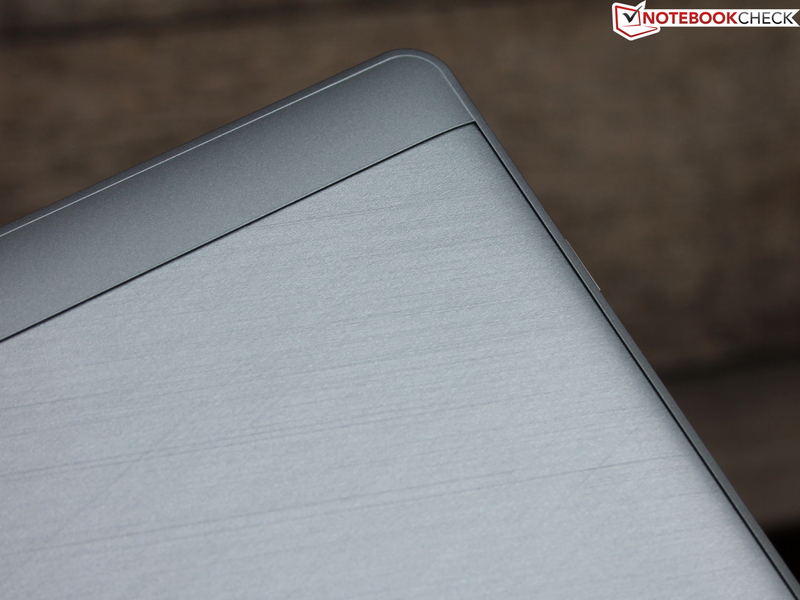 The back cover has a brushed finish, so it looks like aluminum. 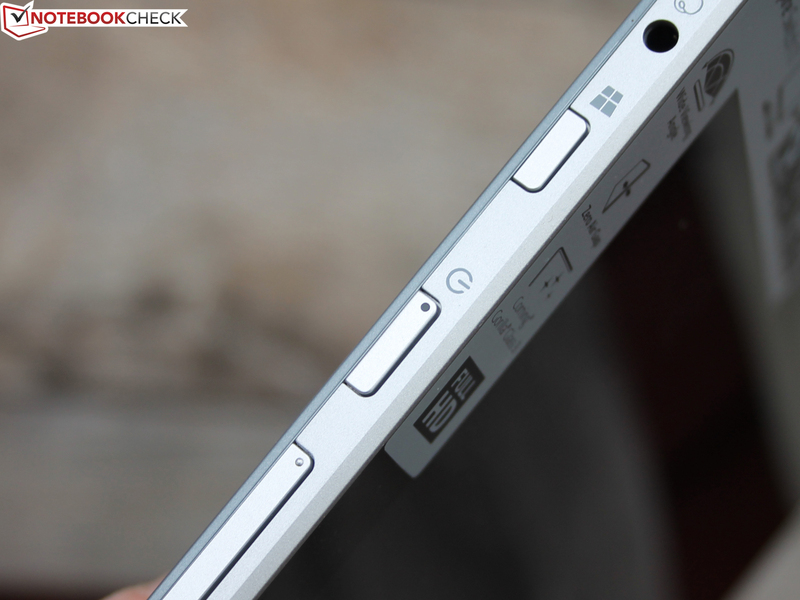 The whole back of the tablet is a single piece that is slightly shifted when you try to twist the device. You could open the device in this scenario, but we did not try it to avoid any damages of our review unit. 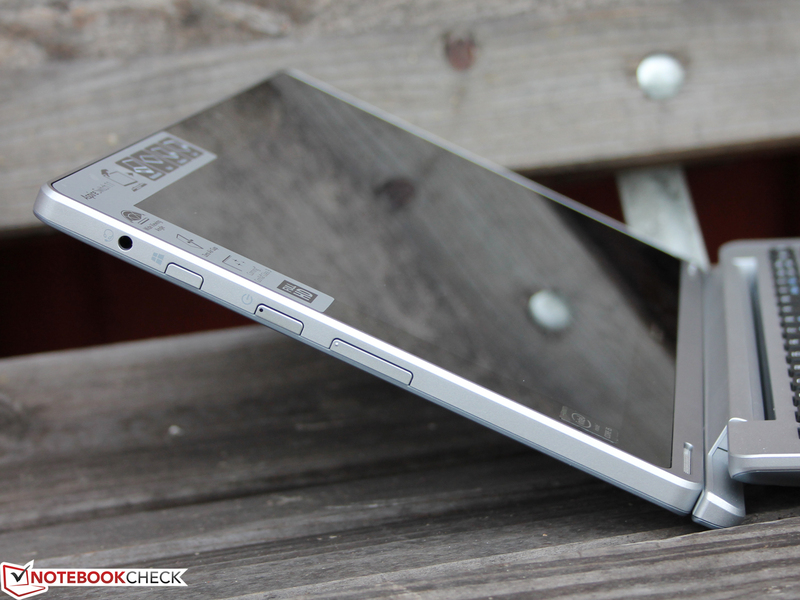 With a height of 11 millimeters and a weight of 843 grams, the tablet is pretty bulky and also heavy. But that should not be surprising when you consider that Acer had to integrate a 32 Wh battery as well as a passive cooling solution. Furthermore, you get a full-size USB port (type A). The torsion resistance of the tablet as well as the base unit is pretty weak and you can twist them to a certain extent. There are, unfortunately, visible distortions at the display frame even when we just hold the tablet in our hands and apply some pressure (standard usage scenario). It seems that the connection between the chassis and the panel is too tight. The base unit "unfortunately" only weighs 798 grams. Why is that a problem? The Switch 11 easily tips over when the opening angle is too big. This happens at around 135 degrees, which means you can still use a convenient angle. The manufacturer reinforced the base unit with aluminum panels on the inside, so you cannot dent the palm rest even with a lot of force. The detachable bottom cover (HDD can be replaced) is reinforced by additional panels as well. This improves the sturdiness, but the cheap haptic impression of a hollow body remains. How can you undock the tablet? Lever? Button? No, you just have to pull pretty hard at the tablet to release the magnetic fixation and use the tablet without the base unit. Advantage of this solution: There are no mechanical hooks or locks that could break. Disadvantage: You might "lose" the tablet when you grab the Switch 11 at the keyboard. The magnetic fixation cannot really prevent that. 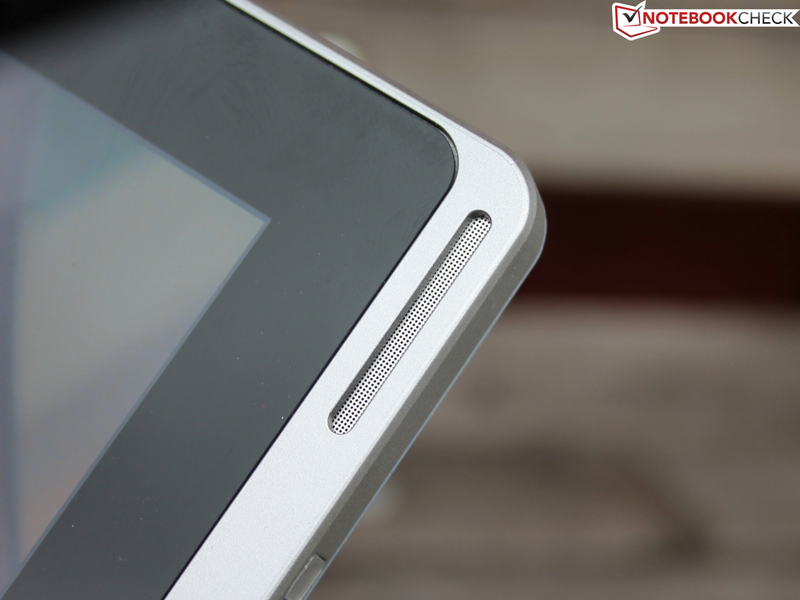 The two massive pins ensure that the tablet cannot move along the bottom of the hinge. By the way, the two magnets are at the center of the tablet and the dock, respectively (right and left next to the Acer logo). The Switch 11 does not really offer many ports, but at least more than many other Windows tablets with up to 10-inches. Similar to the main rivals you get a full-size USB 3.0 port as well as micro HDMI. Another USB port is located at the dock, but it only supports the 2.0 standard. 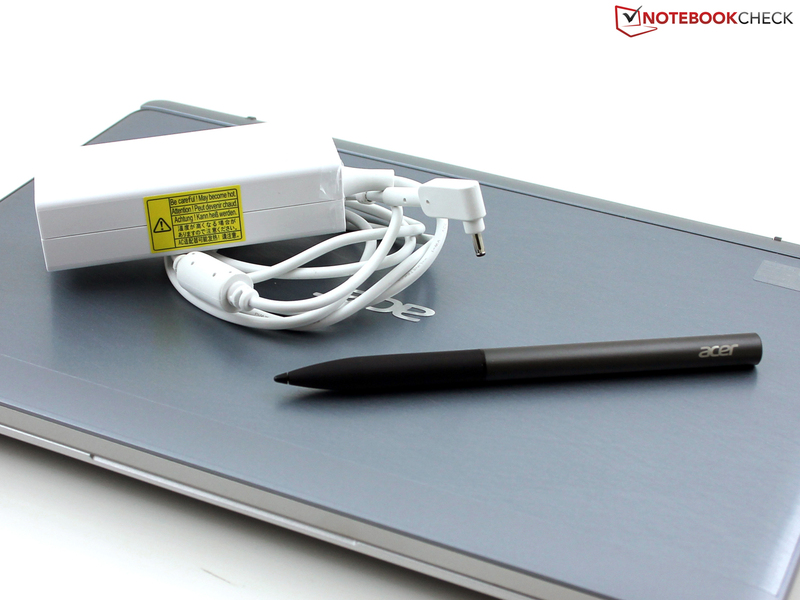 Included: 45-Watt power adaptor and Acer Active Pen. It is an active digitizer pen. Quick-start guide, BYOC - Build Your Own Cloud. 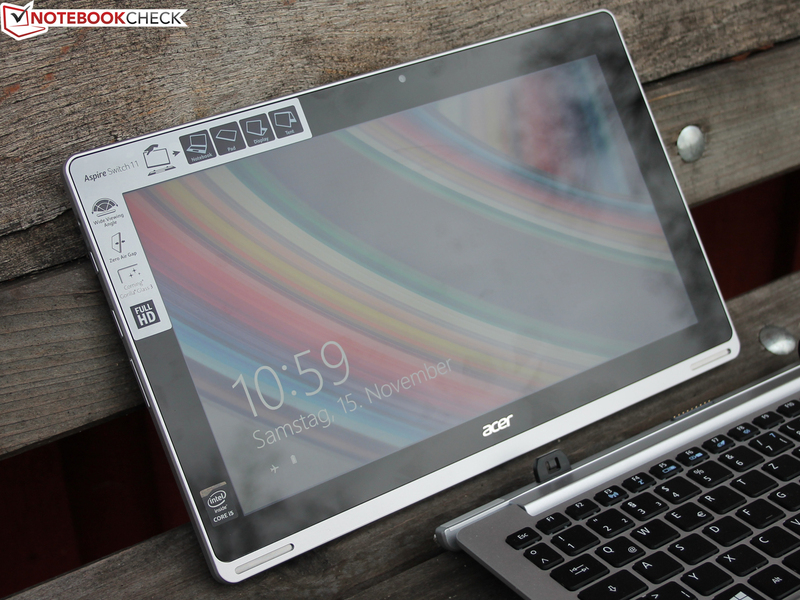 Acer Screen Grasp (screenshot tool). Inside the device is an Atheros WLAN module with support for the standards b/g/n in 2.4 GHz as well as 5 GHz networks (dual-band). We were disappointed by the range of the wireless module in our test, the connection dropped with a distance of around 20 meters outside the building. Some competitors are much better (around 40 meters). Our Switch 11 showed 2 up to 3 bars with a distance of 15 meters and notebookcheck.com was opened without delays. Bluetooth 4.0 is supported. As far as we know there is no configuration with an integrated 3G/4G modem. The tablet has a couple of sensors, including the usual rotation sensor and ambient light sensor. 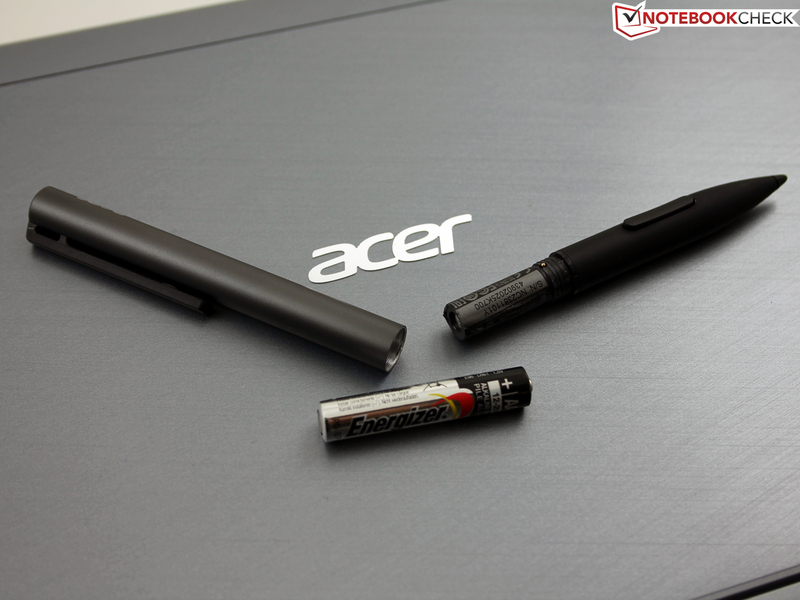 Besides the power adaptor you get the Acer Active Pen (digitizer with battery). The small AAAA battery was unfortunately empty or defective in our case, but the pen worked flawlessly with a replacement. Acer preloads some tools like Video Player, Quick Access, Care Center, Hover Access, Touch Tools, Power Management or Acer Portal. 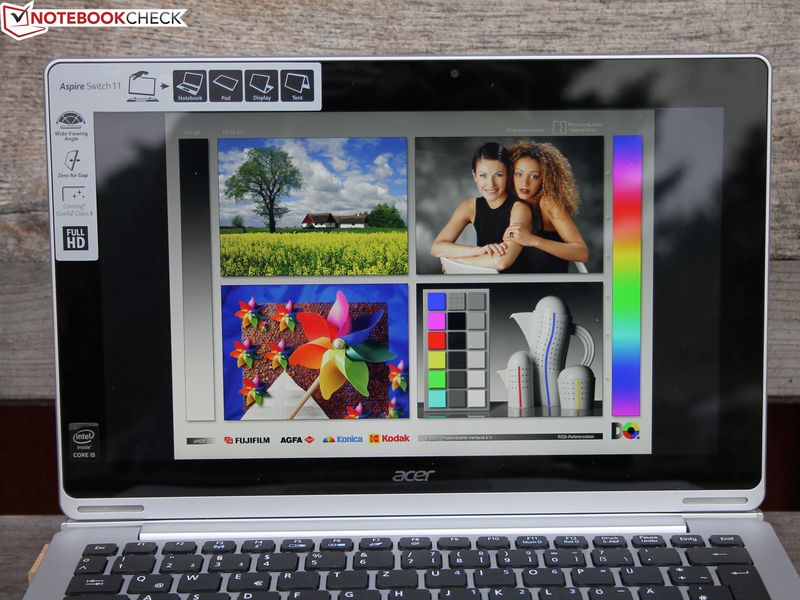 We liked Acer Screen Grasp, a tool for screenshots that can be launched with the touch of three fingers and includes all important editing features. Power Management only shows USB devices that consume a lot of power and you can deactivate the HDD of the keyboard dock. 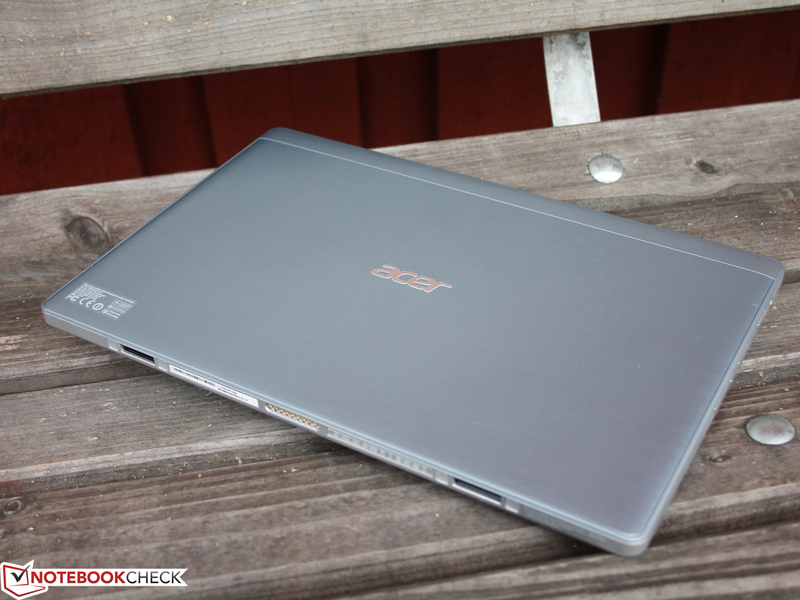 The useful application Quick Access is described in the review of the Acer Aspire Switch 10. The hard drive in the keyboard dock can be replaced. The standard warranty period is 12 months. Acer’s Advantage Light is a 3-year warranty with a carry-in service and a 1-year International Traveller Warranty that is available for around 60 Euros (~$68). 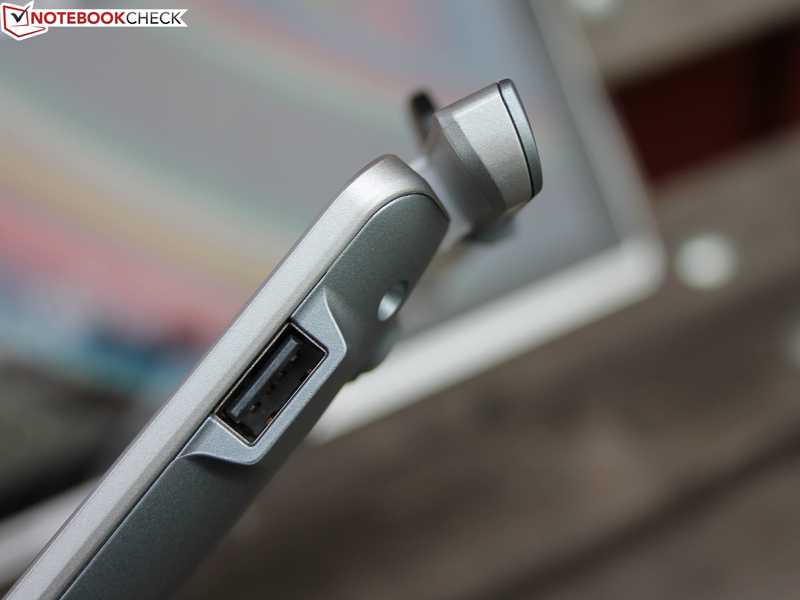 The webcam of the Switch 11 takes pictures with a maximum resolution of 1280x720 pixels. Even though the focus works pretty well, pictures still look like impressionistic watercolors, even under daylight. Areas are very blurry and edges are rough. It will be sufficient for video chats, but not for eBay auctions. Our sample recording with the microphone suffered from electronic background noises. It sounded tinny and almost like the speaker was sitting in a trash can with a distance of two up to three meters. Not a good result, but Acer only integrated one single microphone. The integration of a keyboard with a long travel and large keys is a good starting point, but Acer unfortunately misses the target of an input device with a good feedback because of the spongy stroke, which is also bouncy in the center. The keys are completely flat and the lettering is sufficient. There is no background illumination, but the Transformer Book Trio and the Surface Pro 3 have one. An illumination should be available in the price range of the Switch 11. 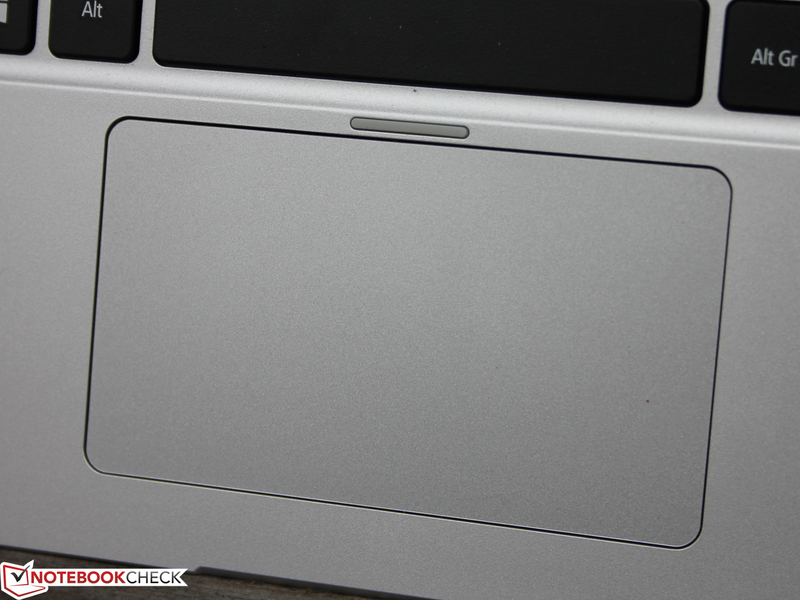 The ClickPad has a long travel and an audible pressure point. This ensures a quick handling, even drag & drop worked pretty well. However, the haptic and the acoustics are a bit clattery, which is also caused by the light clicking noise. The 10-fingers touch panel has good gliding capabilities and can be quickly operated. 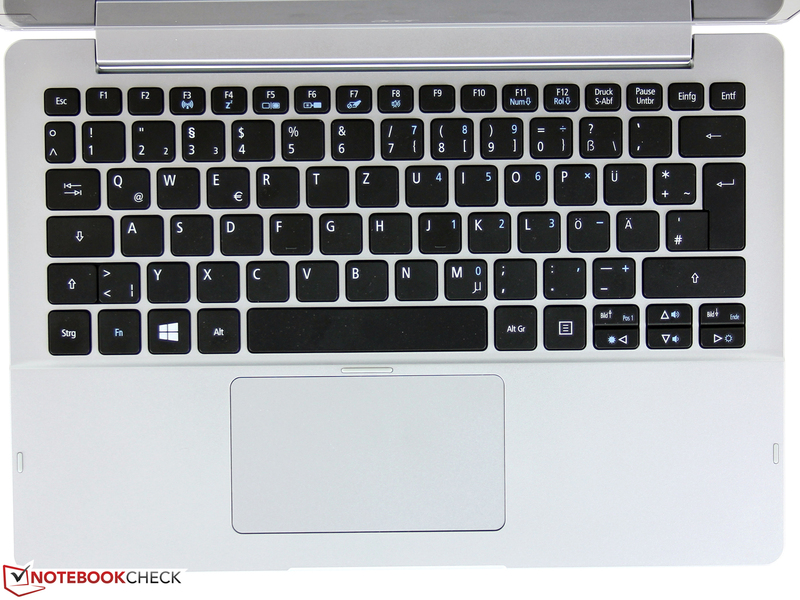 It is sensitive up into the peripheral areas, both for inputs with the pen or with the hand. By the way, you can also attach the display the other way around with the back cover facing towards the dock, so you can use the tablet and still carry the whole device. Acer’s Active Pen is better suited for markings or notes compared to the keyboard or the ClickPad. 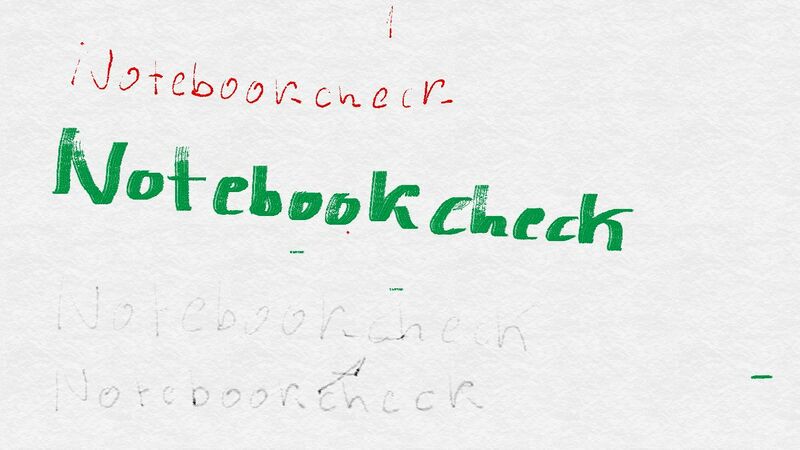 The pen is more comfortable, faster and especially more precise on the screen. We are still completely happy with the inputs via fingers: Actions are executed instantaneously and the surface does not "stick" to the finger. Long travel but spongy stroke and soft pressure point. 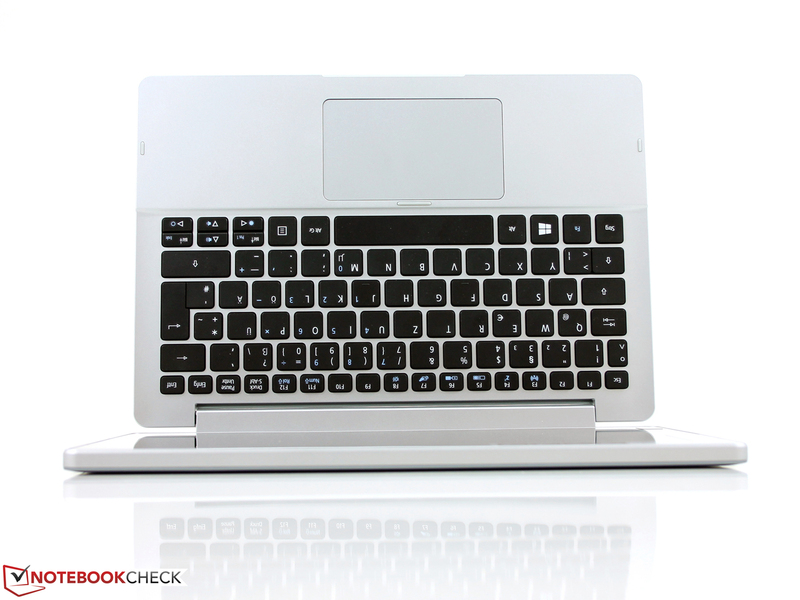 Large ClickPad with good travel and smooth stroke. Acer Active Pen - improved writing, marking and drawing. Active Pen in Fresh Paint. 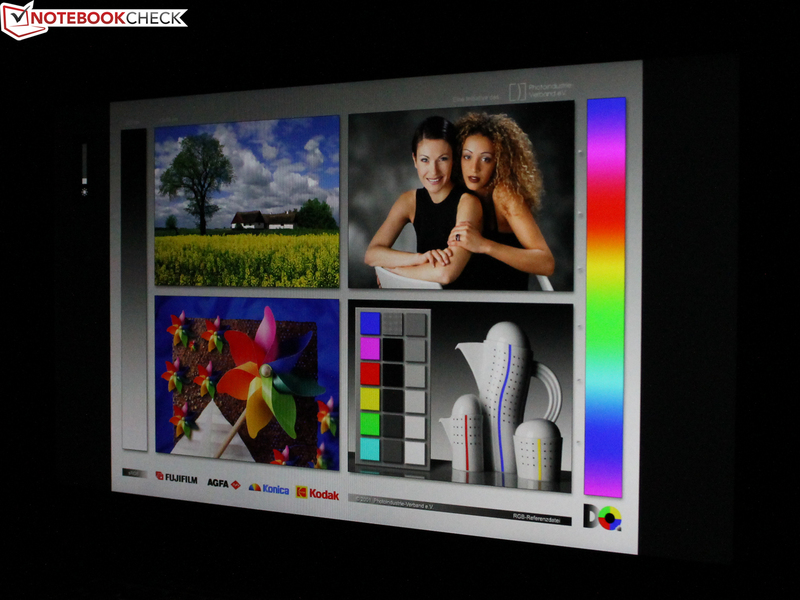 The Chi Mei panel (designation CMN1133) has a resolution of 1920x1080 pixels and a screen ratio of 16:9. This results in a pixel density of 190 ppi on the 11.6-inch screen. The panel can recognize up to 10 fingers simultaneously, while the smaller Switch 10 only has a touchscreen with 5 touch points. The brightness of 251 cd/m² (on average) is worse compared to the rivals. But not only the first three devices in the following table are 20 up to 30% brighter, even the follow-ups are better. The panel is really bad in terms of clouding, there are visible spots at the edges, and they get much bigger and annoying when you hold the tablet in the hand. 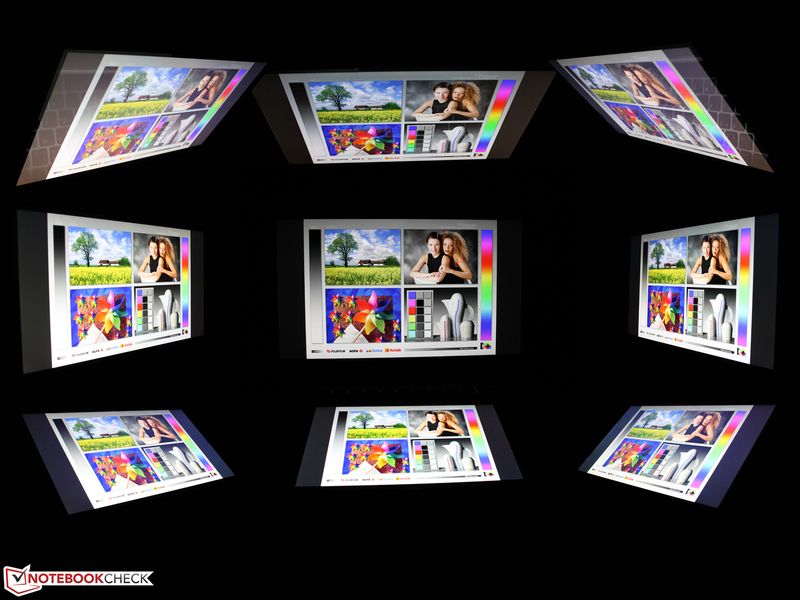 Even light pressure on the left and right display frame results in deviations. The brightness distribution of 83% is actually not that bad, which is a result of our central measuring point (not directly at the edges). The contrast of the review unit is on a level with the other rivals, only Microsoft's Surface Pro 3 is clearly at the top with 1,077:1. We tested the factory settings of the panel with CalMAN and a spectrophotometer and could determine a low grayscale DeltaE of almost 5. A value under 3 would be the target, which means the human eye cannot see a difference between the sRGB reference and the displayed colors. The ColorChecker DeltaE of 5 is not bad, either, and we cannot see a blue cast of the panel. We could not calibrate the panel since our i1Profiler wouldn’t work. The experience with the Switch 11 is not that great outdoors: The maximum brightness is reduced to 196 cd/m² on battery power, which cannot be prevented, even with the deactivation of the light sensor in the Intel driver. The result is that the display already appears very dark on our pictures, even though it was a cloudy day. The panel can be viewed from any angle and does not suffer from deviations. The contrast can be maintained, symbols and fonts are always sharp. The reflections are annoying when you work outdoors. But the effects are tolerable in the shade or with a cloudy sky. 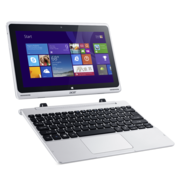 Acer sells several versions of its Aspire Switch 11: An entry-level version (32 GB, Atom Z3745, IPS HD) starting at 399 Euros (~$453), a mainstream version (60 GB, i3, FHD IPS) for around 600 Euros (~$682) and finally the premium configuration (128 + 500 GB, i5, FHD) for 900 Euros (~$1023). 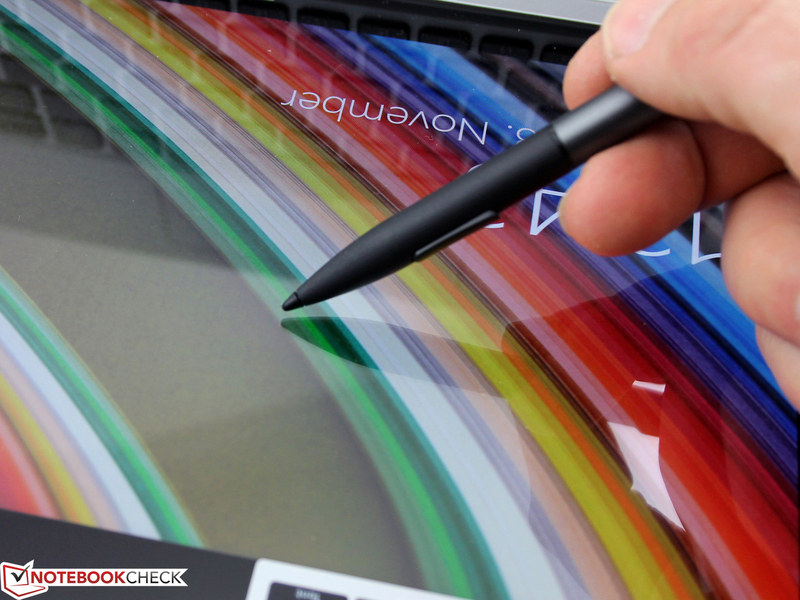 Every model is shipped with the keyboard dock, but the Active Pen is only included with the premium version. 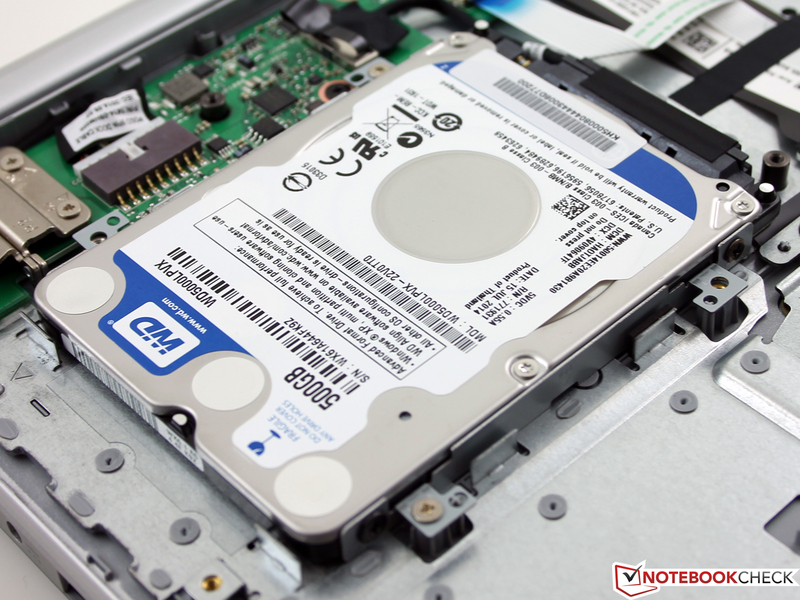 We will have a quick review of the entry-level version soon, where we can check if the less expensive models can be equipped with a 2.5-inch SATA HDD (7 mm) or an SSD. You get a lot of storage capacity; 89 GB is free ex-works on the tablet and 465 GB on the hard drive in the dock. You could add a microSD card (microSDHC). 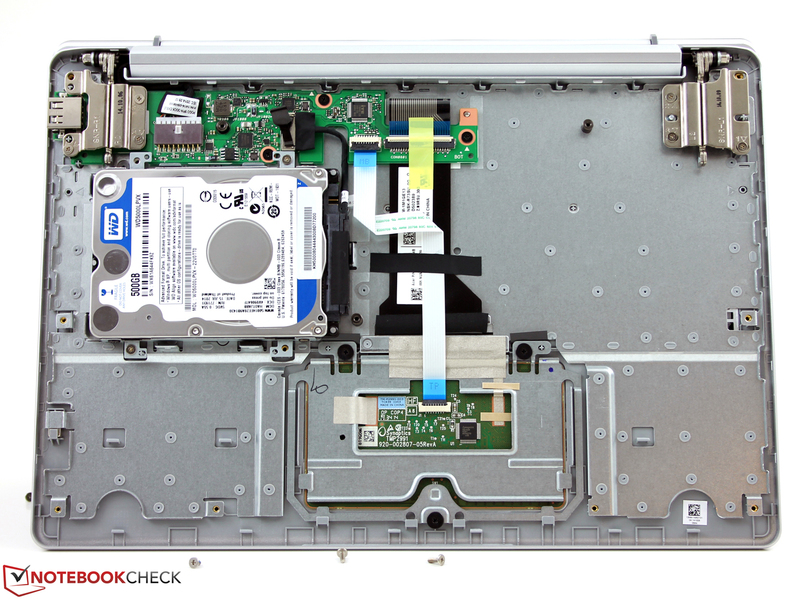 Acer decided to use a thin HDD from the company Western Digital (WD5000LPVX-22V0TT0, 2.5-inch, 5,400 rpm, 8MB cache, SATA 6 GB/s, 7 mm). The Intel Core i5-4202Y (1.6 GHz) is based on Intel’s Haswell generation, which is currently replaced by Broadwell. In theory, the Turbo is supposed to reach up to 2.0 GHz (single-core), but we could not confirm this during our tests. The Cinebench R15 Single test is executed with a steady clock of 1.7 GHz, which also applies for multi-core load. The Cinebench Multi results are similar on battery power, so there are no performance limitations. The CPU stress test Prime95 results in a drop to 1.5 GHz, but it does not drop below the nominal value so there is no throttling. 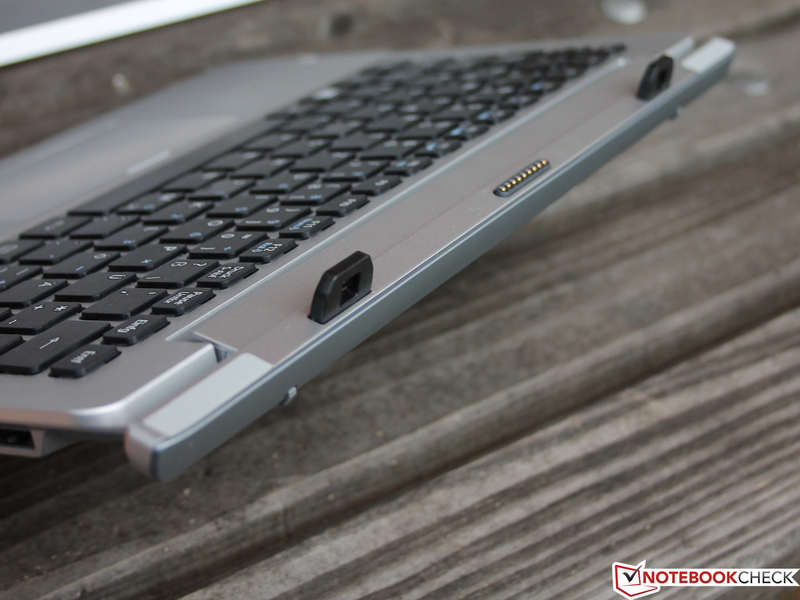 Compared to the rivals, the Switch 11 is a bit better than the Bay Trail Pentium in the Yoga 2 11. The old Core i7-4500U of the Transformer Book Trio TX201LA shows what is possible in a convertible when the CPU has an active cooling solution. 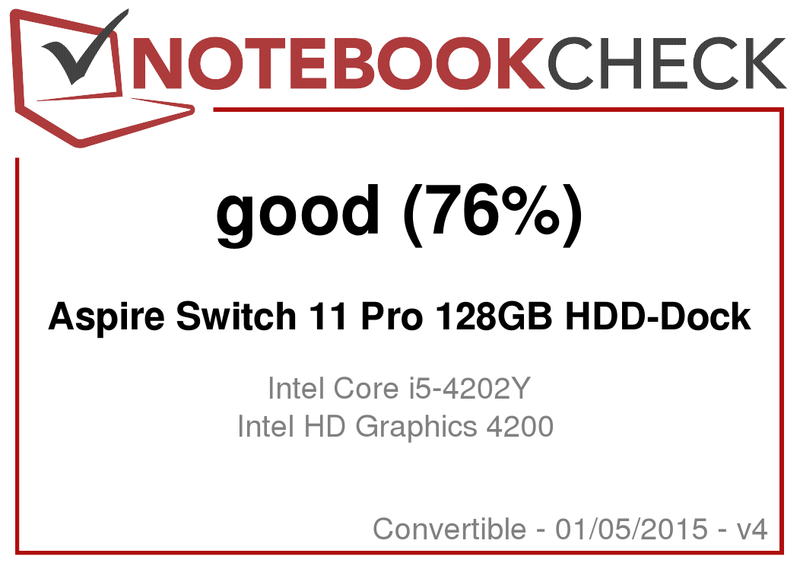 The new Core M in the Venue 11 Pro can only manage a small lead, so there is no reason to wait for Broadwell in the Switch 11 in terms of the performance. Both PCMark 7 and 8 determine good results and the Switch 11 can sometimes surpass the rivals. The CPU performance, however, falls a bit behind; the i7-4500U and i5-4300U in the Transformer Book Trio and Surface Pro 3, respectively, are just faster. Still, the Productivity and Creativity (PCMark 7) as well as the Home and Creative scores (PCMark 8) are better, which is a result of the fast SSD. The 128 GB SSD in the tablet manages very good transfer rates that result in an excellent AS SSD total score. 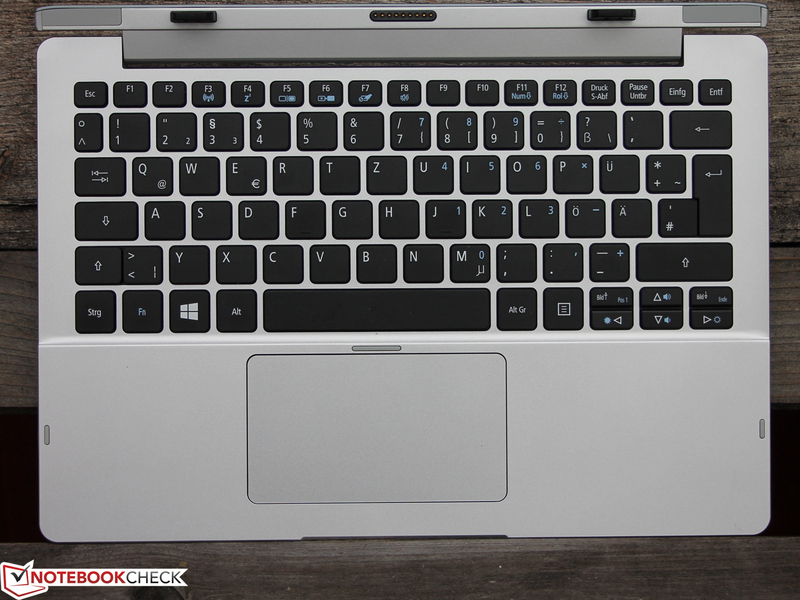 PCMark 7 System Storage also noticed the SSD and measured it as more than 70% faster than the HDDs in the Yoga 2 11 and Transformer Book Trio. This is realistic in an HDD to SSD comparison, which is confirmed by the results of CrystalDiskMark 3.0. The other SSD convertibles are on a level with our review unit. The hard drive in the dock seems to be something like a Fiat 500 racing in Formula 1. While the SSD in the tablet manages excellent results, the HDD is extremely slow. It only reads with 32 MB/s, not to mention the poor 4K access times. Even our external USB 3.0 HDD that we attached to the tablet reached 70 MB/s. 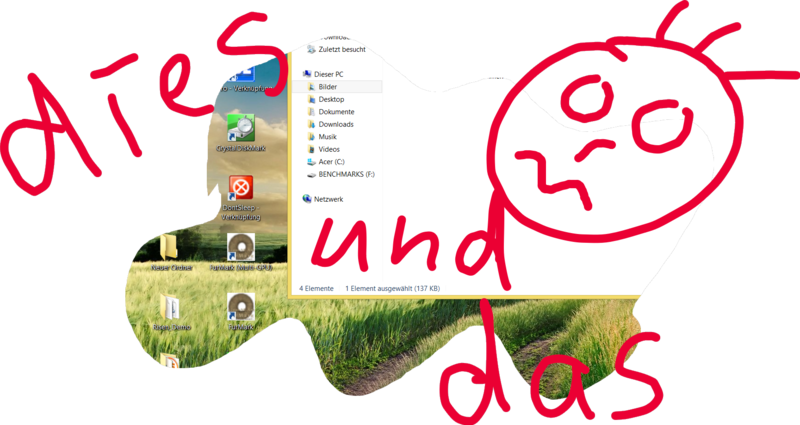 The reason: the dock is attached via USB 2.0, which obviously affects the transfer rates of the HDD as well. The low-end processor GPU HD Graphics 4200 runs with 200 - 850 MHz, which means it cannot keep up with the performance of higher-clocked versions of the HD 4000 that powers the Transformer Book Trio TX201LA, for instance. The new HD 5300 (Core M) is much faster (30%) with a lower TDP. 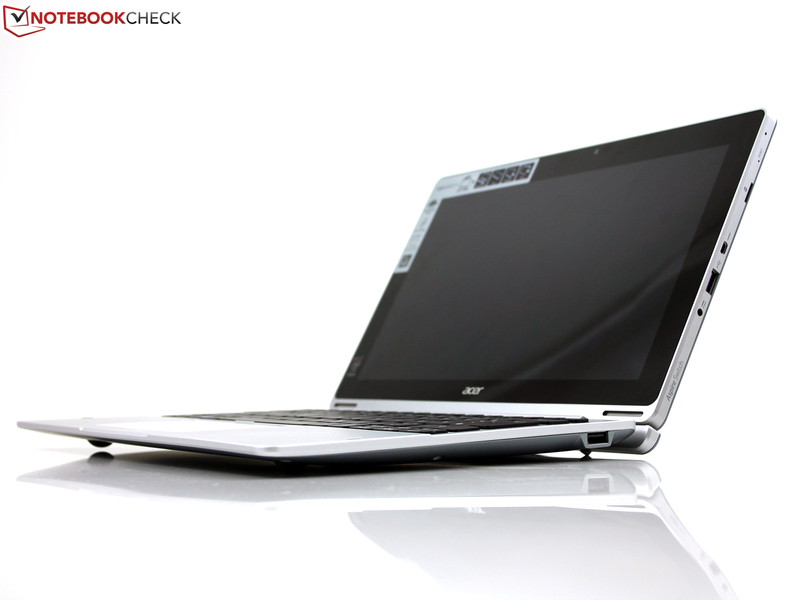 Acer uses a dual-channel memory configuration, so the performance is slightly better compared to other HD 4200 devices. Gaming should not be a priority for users of the Switch 11. 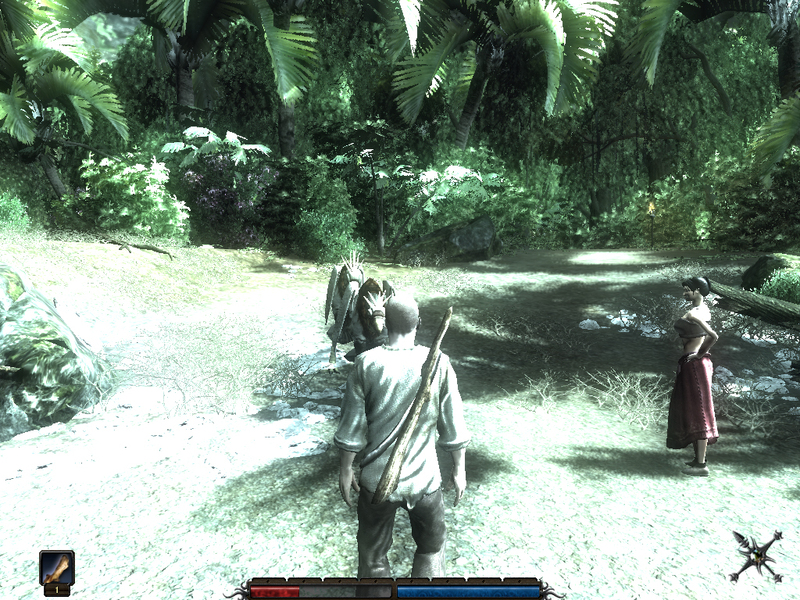 Only some older titles can be played smoothly with the lowest settings, like Risen from 2008, for example. The HD 5300 is better in this scenario, even though the difference is smaller with higher details. 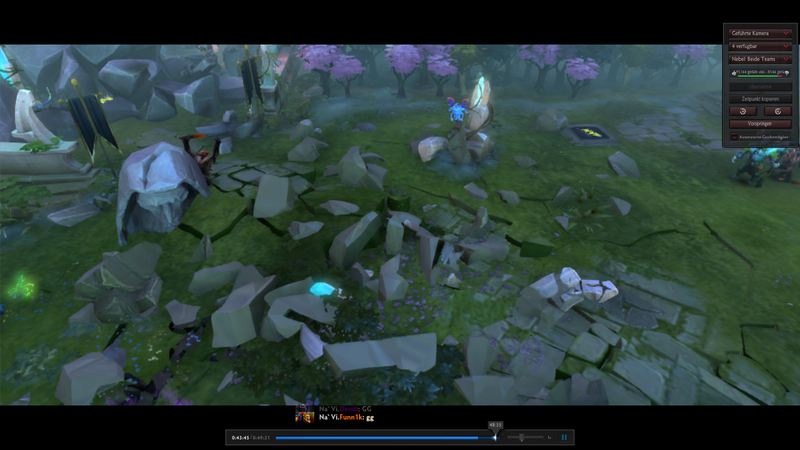 Dota 2 shows that our HD 4200 is faster compared to a Bay Trail GPU (Yoga 2 11), but it is more likely that this game benefits from the faster processor. The noise development is limited to the quiet operating noise of the HDD. 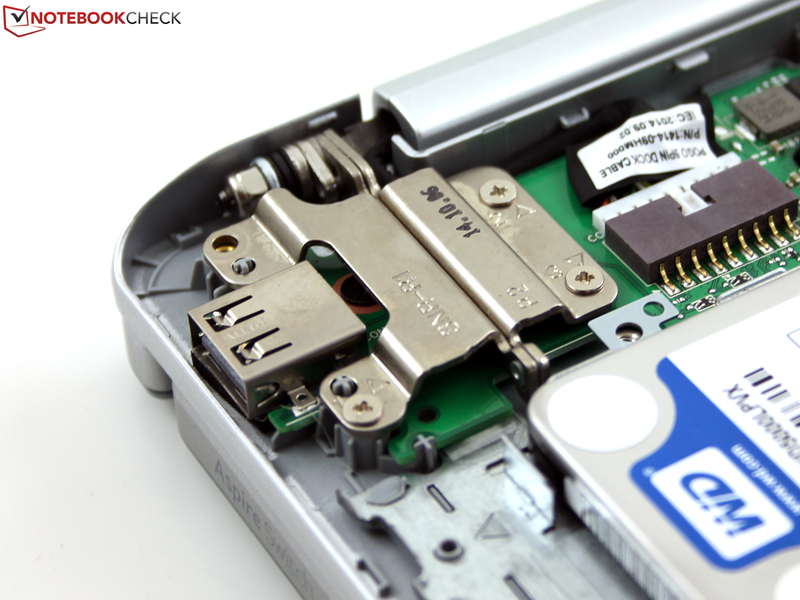 However, the Switch 11 is usually completely silent since the HDD is deactivated when it is not being used. 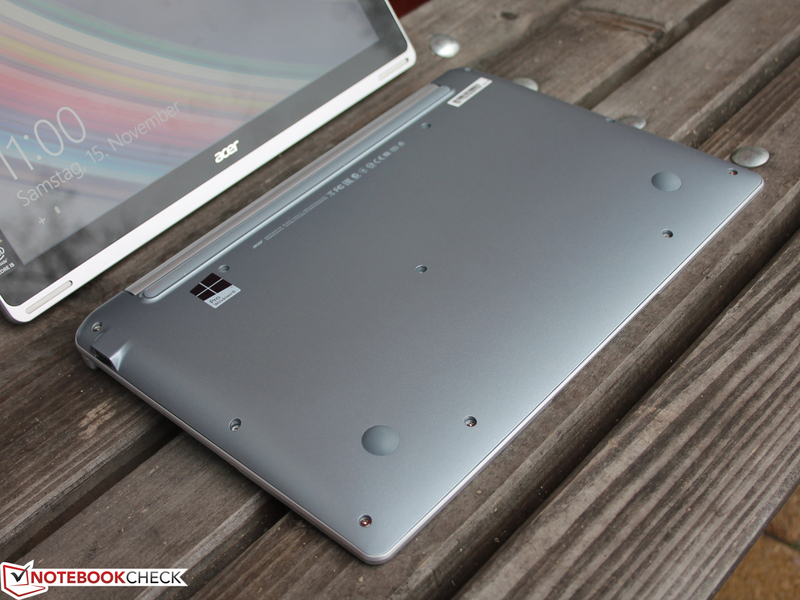 The IdeaPad Yoga 2 11 is fanless as well, but not the Transformer Book Trio TX201LA and the Microsoft Surface Pro 3. The latter, however, only gets very loud under continuous load; the Transformer Book is audible even with light workloads. The Switch 11 barely warmed up under light workloads with longer idle periods, where the idle chart roughly shows the temperatures of the tablet. We did not measure the temperatures at the dock. The situation quickly changes under load, where we can see some hot spots at the right side with up to 47 and 46 °C at the top and the bottom, respectively. Our review cannot execute the stress test without throttling. After the Core i5-4202Y can maintain 1.6 GHz for a couple of minutes (70 °C), it throttles to 900 up to 1,000 MHz for the rest of the test, which resulted in a SoC temperature of around 60 °C. This throttling should not be an issue during everyday use, even though the Turbo utilization is pretty limited (also see Performance). (±) The average temperature for the upper side under maximal load is 36.7 °C / 98 F, compared to the average of 30.3 °C / 87 F for the devices in the class Convertible. (-) The maximum temperature on the upper side is 47.5 °C / 118 F, compared to the average of 35.4 °C / 96 F, ranging from 21.8 to 55.7 °C for the class Convertible. (+) In idle usage, the average temperature for the upper side is 27.1 °C / 81 F, compared to the device average of 30.3 °C / 87 F.
(-) The palmrests and touchpad can get very hot to the touch with a maximum of 43.2 °C / 109.8 F.
(-) The average temperature of the palmrest area of similar devices was 29 °C / 84.2 F (-14.2 °C / -25.6 F). The speakers are located at the front under the panel, but the position does not really pay off. The sound is thin, focuses on the medium tones and the maximum volume is not really high. There is no sign of bass of differentiated high-tones, either. This means you should use headphones, which can be attached at the combined microphone port with the stereo jack. 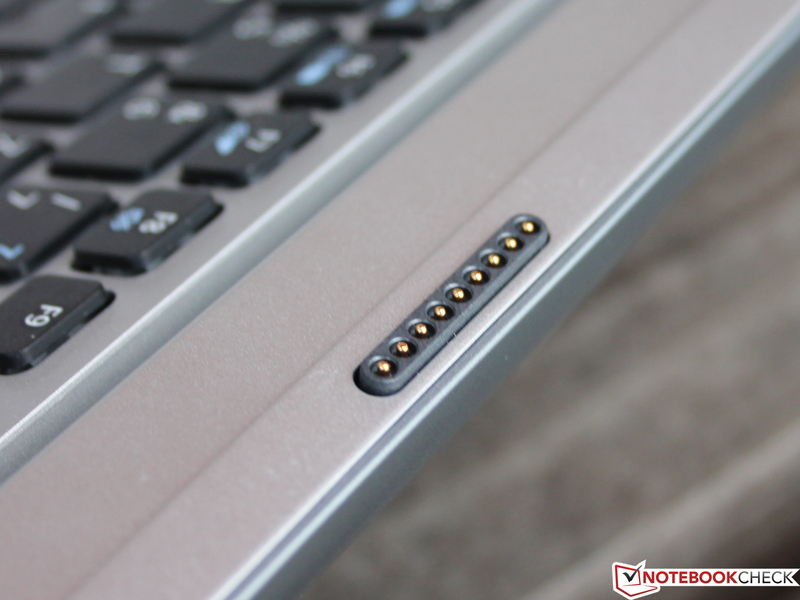 The power consumption is very similar to the IdeaPad Yoga 2 11, despite the different chipsets. We measure 3 up to 8 Watts while idling and the dock was always attached for our measurements. 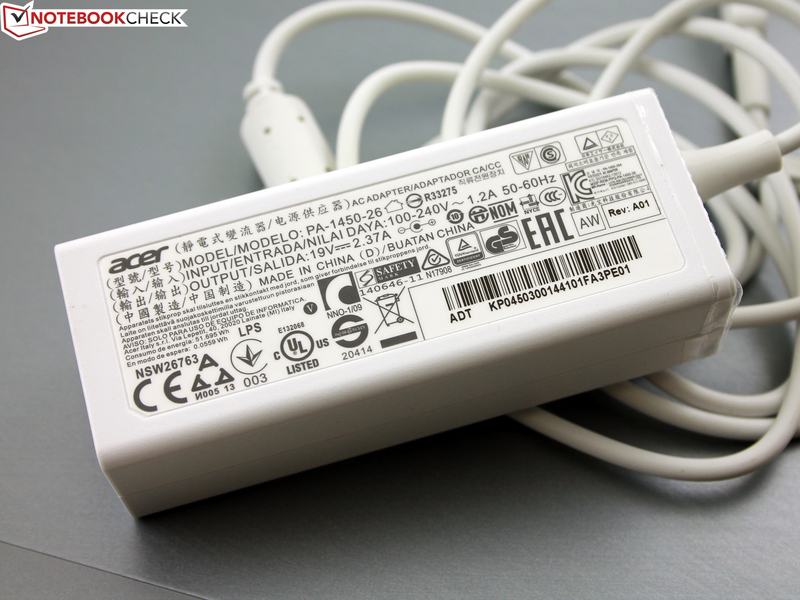 The 8 Watts is a result of the active HDD, the brightness alone does not cause such a big difference. On a very similar level under load is the Core M in the Venue 11 Pro 7140. However, this 10-inch device manages much better runtimes thanks to its lower idle consumption. The power adaptor needed around 3:30 hours to charge the battery, which is a disappointing result when you consider the short runtimes, like 4:20 hours in the WLAN test, for example. Even the idle runtime of almost eight hours is far away from the Microsoft Surface Pro 3 (WLAN 504 minutes) or the Dell Venue 11 Pro 7140. 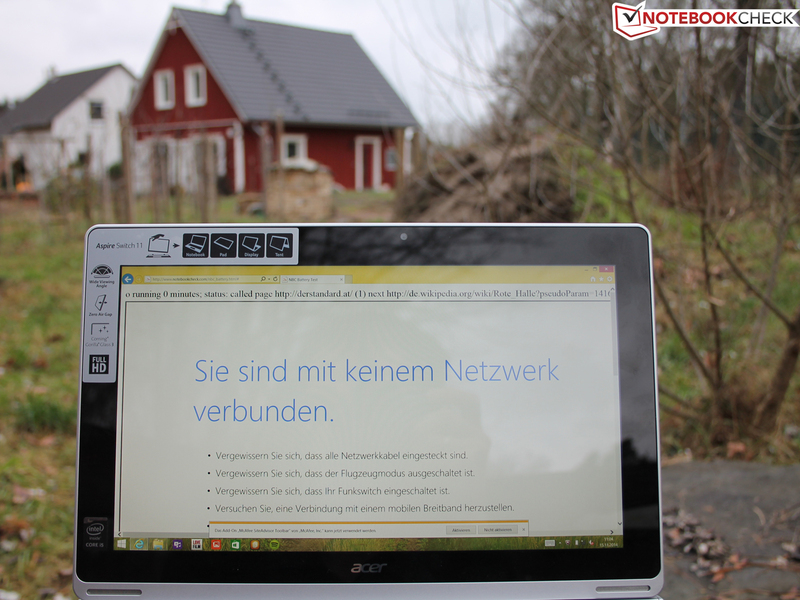 The rivals Yoga 2 11 and Transformer Book Trio TX201LA, however, are not much better with half-an-hour more in the WLAN test. We would have liked to see an additional battery in the dock, similar to the Venue 11 Pro. This would have increased the weight, but also prevented the device from tipping over. 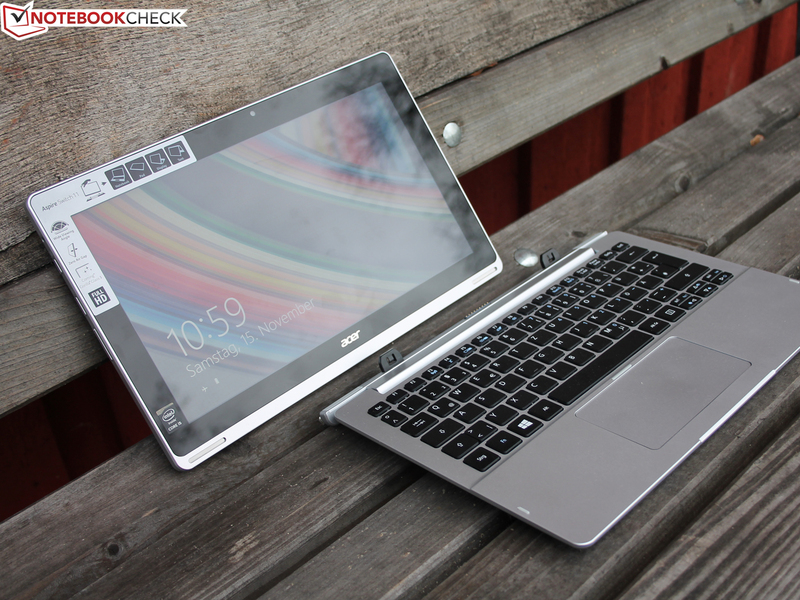 Acer’s Aspire Switch 11 Pro with a keyboard dock is an ambitious project. The identical chassis is supposed to attract users in different price ranges from 400, 600 up to 900 Euros (~$454, ~$682 to ~$1023), which is realized with different CPU, memory and display configurations. This is actually the biggest problem of the device. The quality of the chassis does not really meet the price tag of 900 Euros (~$1023), where high-end tablets like Microsoft's Surface Pro 3 are dominating the market. Even the cheaper and more powerful Transformer Book Trio TX201LA has a more sophisticated construction and better input devices. 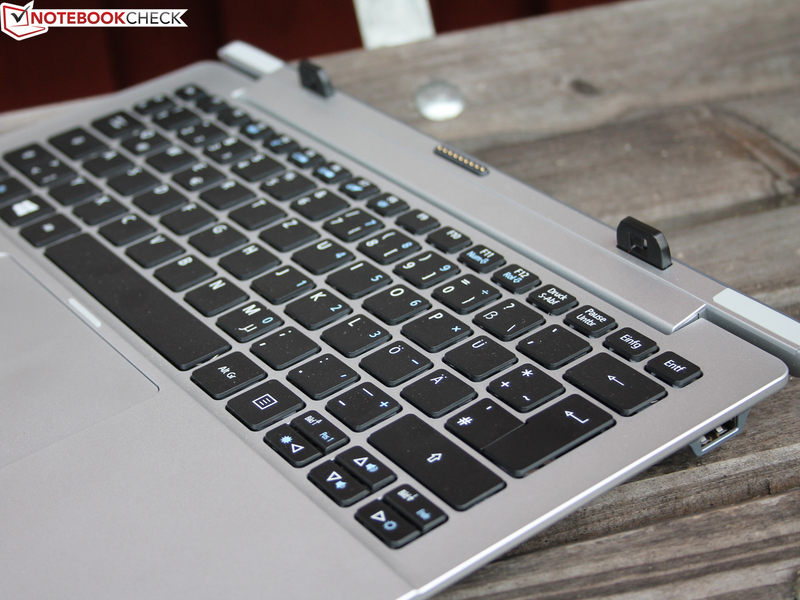 Lenovo’s IdeaPad Yoga 2 11 has a better build quality as well and is available for 500 Euros (~$568). 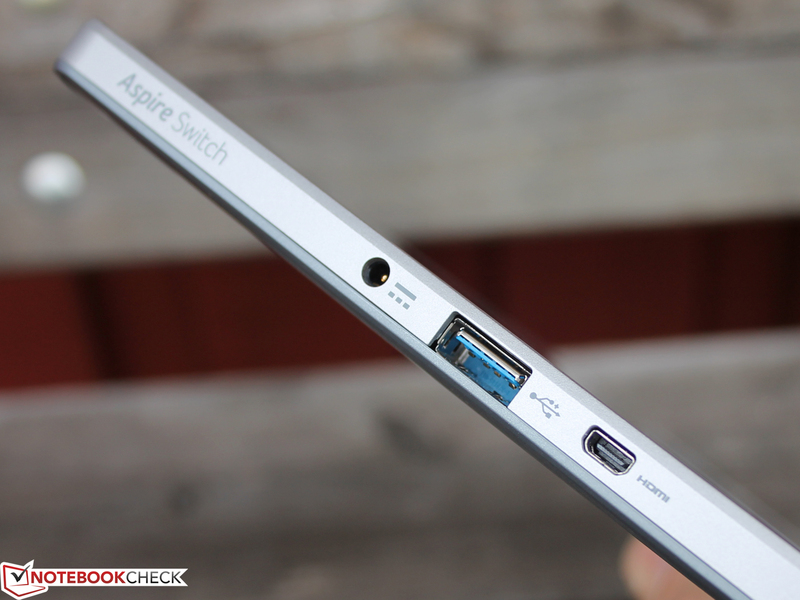 However, the Aspire Switch 11 Pro also has some advantages: The application performance will be sufficient for many users and easily beats the devices with Intel Atom/Pentium chips (Bay Trail). The temperatures are low with simple tasks and the system does not require a fan. The Full HD panel (IPS) meets the price tag, but it unfortunately suffers from strong clouding at the edges as well as the comparatively low brightness. Two of the few selling points for the Switch 11 are the hard drive in the dock and the digitizer panel with the included active pen. But that’s pretty much it, which results in the low rating. Because of the mentioned issues we cannot give a real recommendation for the device. If you like the concept with an HDD in a convertible, you should have a closer look at the IdeaPad Yoga 2 11 and the Asus Transformer Book Trio TX201LA. 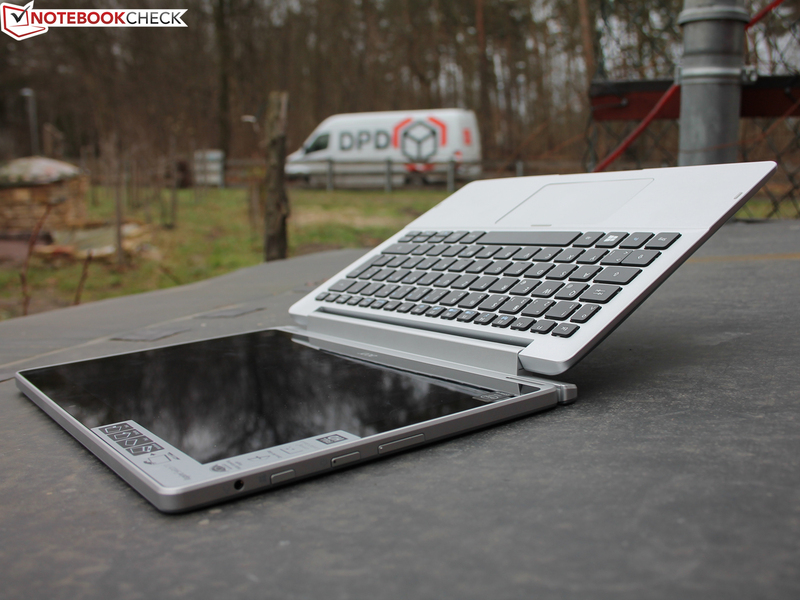 In review: Acer Aspire Switch 11 Pro 128GB + keyboard dock. Test model courtesy of Notebooksbilliger. 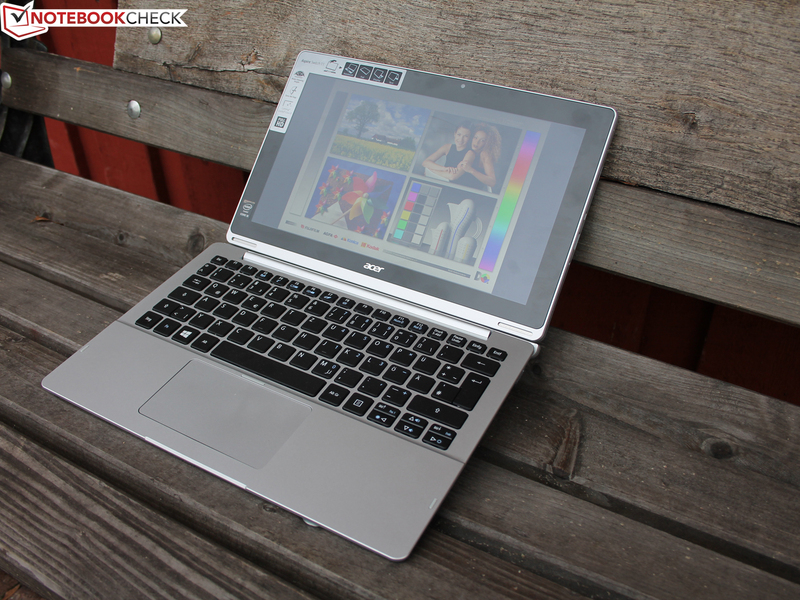 Acer's Switch 10 was a sophisticated convertible. Only the performance of the Intel Atom SoC was a bit low. 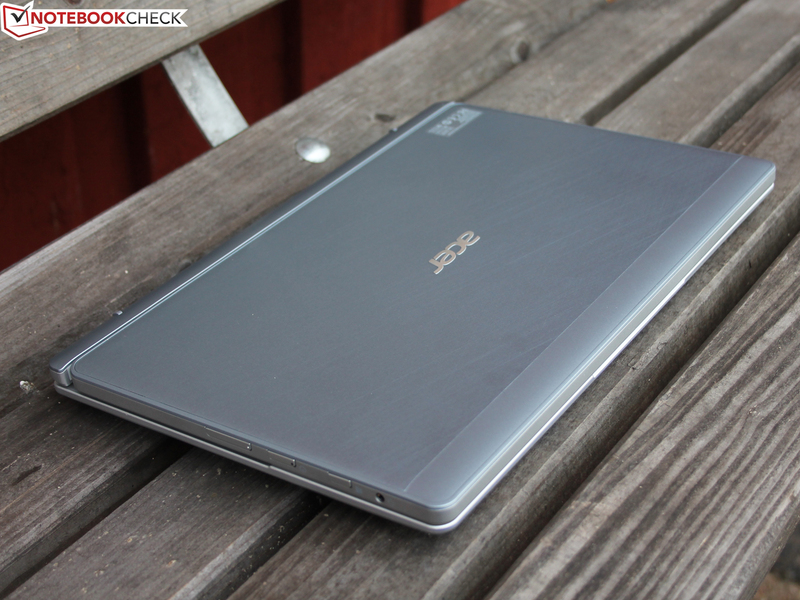 ...and Acer sells it as the Acer Aspire Switch 11 Pro. ...but also an IPS panel with 1920x1080 pixels. 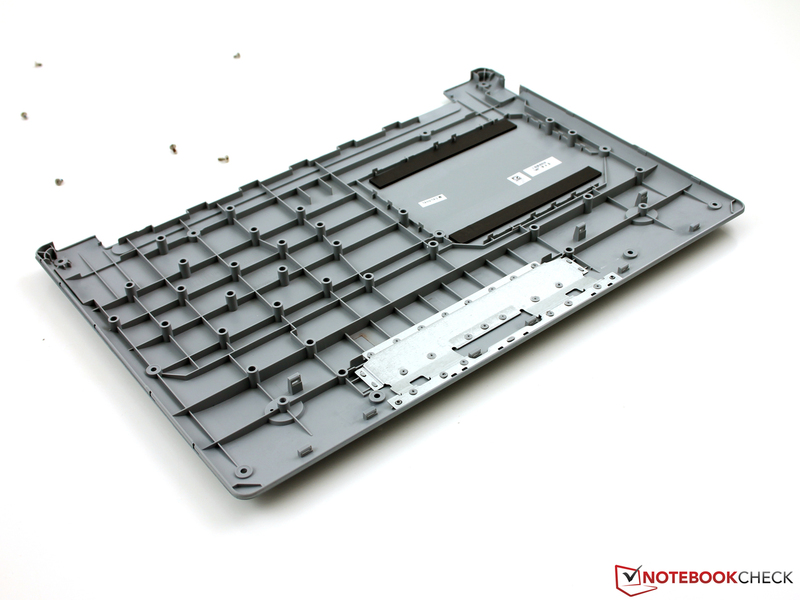 The tablet doesn't require an active cooling solution (fanless). ...but a 500 GB hard drive that is attached via USB. 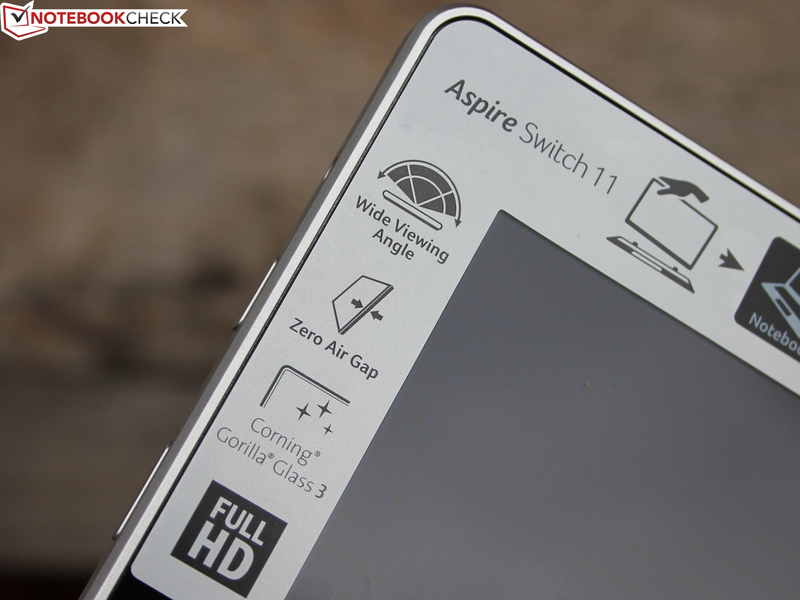 ...those are probably the biggest selling points for the Aspire Switch 11 Pro. ...but the tablet doesn't snap into a shaft. ...has a full-sized USB 3.0 port. The Windows button (Home) is not located underneath the display, but on the left side. The torsion resistance of the tablet is not perfect. ...and the connection drops at around 20 meters. The keys sound hollow and can be pushed in under pressure, but they have a long travel. This is the opened keyboard dock. The 2.5-inch SATA SSD is attached via USB. The plastic cover of the dock is reinforced with metal. Aluminum panels reinforce the whole working environment. Still, you can twist the cover. The firm hinges leave a solid impression. 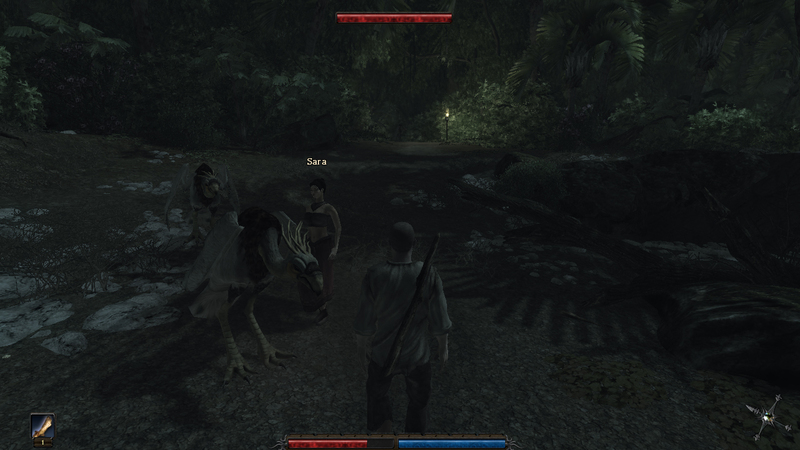 ...but it only has a mediocre luminance (maximum brightness). 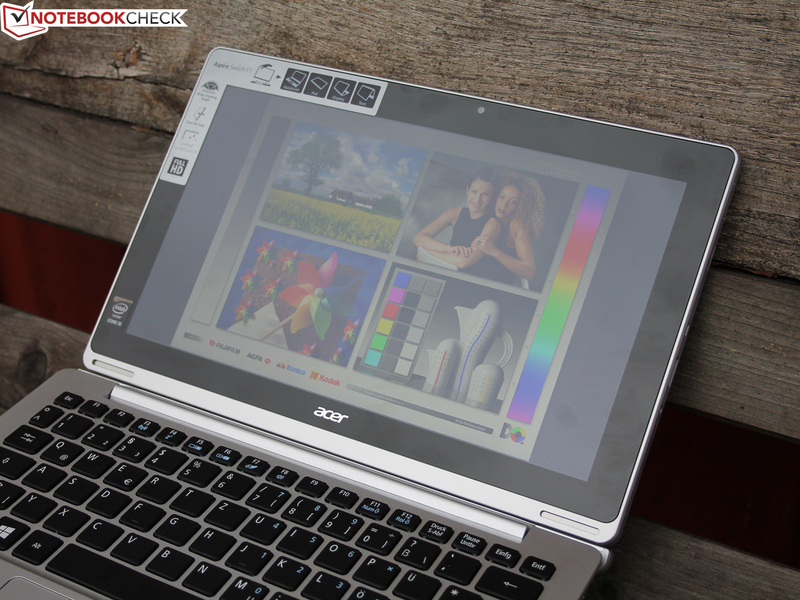 ...Acer clearly targets high-end convertibles. 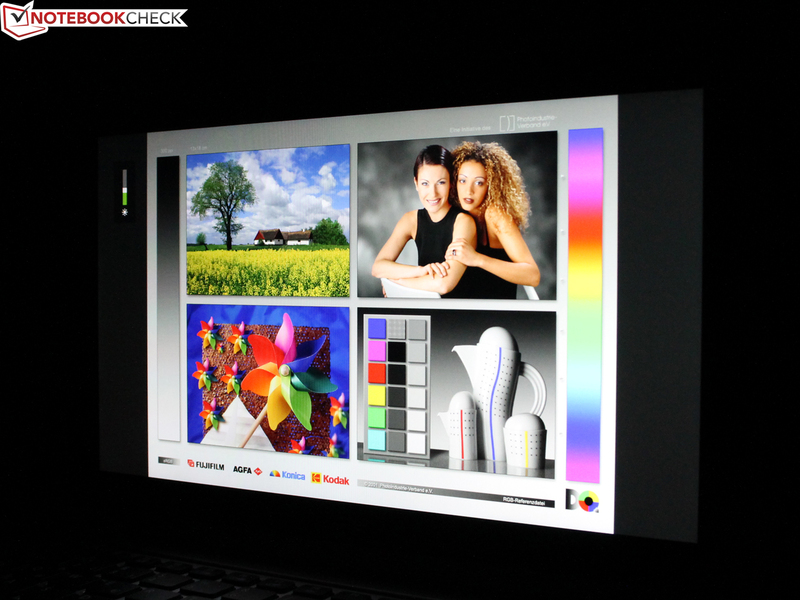 Good: The IPS panel with accurate colors. Compromise: The integrated hard drive is attached via USB and delivers poor transfer rates. Keyboard: Generous layout and long travel. Connected: USB 3.0 type A is a must-have for a business device. Bulky: The fanless cooling for the Haswell Core i5 requires a thick chassis. Quiet hard drive in the dock, so there is a lot of storage capacity. If you get a keyboard with a long travel, it should also have a good stability and a firm pressure point. An expensive tablet should have a good front camera nowadays. Why is there clouding at the edges when we just hold the tablet in our hands?